Many people tend to get overwhelmed when thinking about how to pay for college. However, it doesn’t have to be that way. Luckily, there are many resources available to Oklahoma residents that make the process a little bit easier. Between grants, scholarships, and loans, there are many options to help you pay for college depending on your unique financial situation. Are you ready to begin your college journey? Then let’s talk about the four steps you should take to fund your college education in Oklahoma. The first step for anyone seeking financial aid is to fill out the FAFSA. FAFSA stands for Free Application for Federal Student Aid. Because FAFSA can be complicated, feel free to check out our step-by-step guide that will walk you through every question. Keep in mind, some grants might have application deadlines that you don’t want to miss, so the sooner you fill out the FAFSA, the better. You can even apply before you know which school you’ll be attending. As we mentioned above, just filling out the FAFSA automatically qualifies you for some grants and scholarships, but not all. The colleges you apply to will look at your FAFSA and automatically qualify you for certain state programs available to you. You will see these results in your financial aid letters. You can also do some research on your own to see what other programs might be available. To begin your search on state funding, you may want to browse the OK College Start website. This website offers helpful advice to Oklahoma residents who are planning for college. You can visit their financial aid planning tab and read through the basics of financial aid, as well as determine your eligibility for different types of financial aid. Oklahoma Tuition Aid Grant (OTAG) is a need-based grant for Oklahoma residents who attend eligible colleges, universities, and career technology centers in Oklahoma. Note: This grant will run out of funds, so you’ll want to apply for your FAFSA as early as possible so you don’t miss out. Oklahoma Tuition Equalization Grant (OTEG) is for Oklahoma residents enrolled at a full-time qualified Oklahoma not-for-profit, private/independent institution of higher education. Teacher Education Assistance for College and Higher Education (TEACH) Grant is for students who plan to become a teacher in a high-need field in a low-income area. This grant is administered by colleges, so you’ll need to check with the school you plan to attend to see if you are eligible. Along with grants, Oklahoma offers a number of scholarships for residents. Oklahoma's Promise is for students whose parents’ income is less than $50,000 a year, and who are taking college preparatory classes. Academic Scholars Program is for students who achieve the National Merit Scholar, National Merit Finalist or U.S. Presidential Scholar designation, or for students who score at or above the 99.5 percentile on the ACT or SAT. For information about Oklahoma grants and scholarships, you can check out CollegeGrant.net. High school guidance counselors can be a great resource when it comes to finding local scholarships, so be sure you regularly check in with them to stay up to date with scholarship opportunities. You can also do your own searches online. Tons of different scholarships are out there, you just have to find them. You can check out the websites of Oklahoma colleges or call their financial aid offices for more information. You can also search for scholarships online by many different factors, including major, scholarships for women, sports scholarships, etc. Many Oklahoma colleges have specific scholarships for students attending that school. For example, here is a list of scholarships for students attending Oklahoma State University. CollegeScholarships.com has a wide variety of scholarships available to Oklahoma residents. Also, Sallie Mae's Scholarship Search is a constantly updated scholarship database. It can be a big help during your hunt for scholarships. Another great resource for scholarships is Big Future by College Board. Besides just scholarships, Big Future can be a super helpful resource when it comes to picking a major or even finding a career. 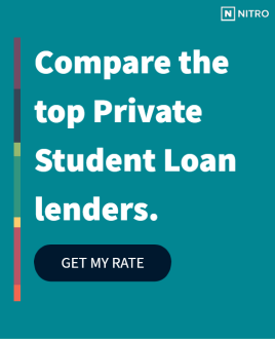 If you’ve gone through your options of grants, scholarships, and federal loans, a private loan can bridge the gap of the remaining difference that you’ll need. Before taking out an Oklahoma private loan, check out our free NitroScore tool. It will help you determine if a private student loan is the way to go or not. Plus, it’s so simple to use. All you have to do is enter a college and a major, and the tool will calculate your total cost of education. It will also tell you your projected salary after graduation and your potential loans needed. From there, you will receive a score that will tell you how easy or hard it might be to repay the loans you take out. You can customize the results of the score by selecting different majors or adding other factors such as savings and scholarships. After utilizing the NitroScore tool, you can find out which of our highly trusted loan partners can give you the best rate. Thanks to all the resources available, a college education is an attainable goal for all Oklahoma residents. Start planning for your future today.